Gift of Doug Beardsley, 2015-2017. 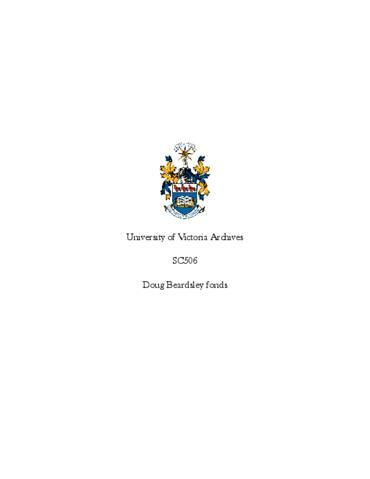 Fonds consists of incoming and outgoing correspondence between Beardsley and various friends, fellow writers, and acquaintances (1967-2017). There are also manuscripts and transcripts of many poems, short stories, and essays, as well as handwritten brainstorming notes written on hotel paper pads and airplane bags. Book reviews for the Times Colonist, correspondence and work regarding the Al Purdy-Doug Beardsley Papers collaborative work, There are also many hand written journals kept by Beardsley from approximately 1969-2017.